Even though it took me ages for me to finish this book (fifty-one days, Goodreads tells me), I loved it from beginning to end. I didn’t really like Interview with the Vampire, the first part of Anne Rice’s Vampire Chronicles, but this was so, so much better. Interview lacked speed, a certain captivating quality, and the main reason for that was probably main character Louis. I thought Louis was way to whiny for a vampire. But in this book we have Lestat, the most vampiry-vampire I have seen in literature. There is just something about Lestat that is so intriguing. He’s thoughts and feelings are completely different from human ones. 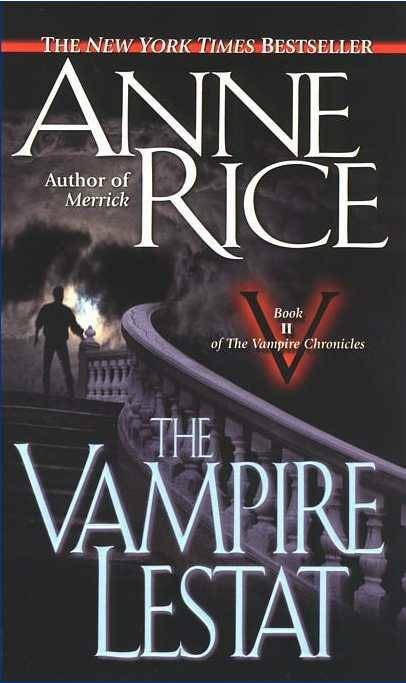 In a lot of fiction books vampires are a kind of enhanced human beings, and I think it was very clever of Anne Rice to stay clear of that. She created a whole new race, that is foreign to us, but by explaining where every thought comes from, she makes them believable, and even relatable. What I also loved about this story is it’s complexity. There are so many layers, all kinds of philosophies, that all collide and became this tale. To truly understand the motives behind the vampires’ actions, one has to really study every little piece of information, and give it the attention it deserves. That’s probably why it took me so damn long to finally finish this book. I read many passages aloud because they were so beautifully written. For me, the intricate sentences Rice has created came to life in a way that felt like poetry. Maybe there is too much descriptiveness for some readers, but I think this story didn’t deserve any less. The characters and the writing really made this story for me. There is not a lot of tension or excitement. This is kind of Lestat’s memoir. Therefore, we all know he will survive everything that comes across his path, but still, it is fascinating to see what is going on in his head, after we have seen only the outside in Interview with the Vampire. And especially how misunderstood he was. How Louis’ own prejudices have clouded his vision. This made me love Lestat even more, even by his own blood he is misunderstood and even hated. And finally a vampire that actually kills people. The current trend is that all “good” vampires must live on animal blood, and resist the temptation of human blood completely. In my humble opinion, vampires should be monsters, true creatures of the night, and what believable creature of the night only nibbles on little rat necks from time to time? Lestat has the perfect balance between good-hearted qualities and some wickedness, to keep it interesting. Slowly but steadily he grew to be one of my favourite characters of all time. Just like he is in love with humans, I have fallen in love with the vampires. The next part of the series, Queen of the Damned, is impatient for me to read it. ‘Ah, the taste and feel of blood when all passion and greed is sharpened in that one desire!’ Lestat: a vampire – but very much not the conventional undead, for Lestat is the truly alive. Lestat is vivid, ecstatic, stagestruck, and in his extravagant story he plunges from the lasciviousness of eighteenth-century Paris to the demonic Egypt of prehistory; from fin-de-siecle New Orleans to the frenetic twentieth-century world of rock superstardom – as, pursued by the living and the dead, he searches across time for the secret of his own dark immortality.